Bruce Willis tells MTV that he doesn't know exactly what the role is he's playing. He said, "I don’t know anything about [my character] yet, haven’t seen any pages yet." Willis then added, "But I’m excited about it." Willis' comments are odd considering his role has been described on the internet as being: Church – The man that hires the ‘Expendables’ (run by ‘Barney’ and ‘Christmas’, assumingly the characters played by Stallone and Statham, respectively) to go after General Garza (who essentially runs his own island – described as a human rights graveyard). He’s an older bloke, and has a connection to the young man who Garza has apparently assassinated. This is personal, in other words. He wants Garza killed and his island burnt down. Five million dollars does the trick. Whether this role has been re-written or Willis is just playing coy for the media is unknown, but I'd put money on the later. One thing Bruce Willis did confirm is that his scene would involve him, Arnold Schwarzenegger and Sly. He explained, "That’s the concept. That’s the plan." "The Expendables" has an insane cast of actors that is sure to be a mega-action event. The cast includes: Sylvester Stallone, Jason Statham, Jet Li, Mickey Rourke, Dolph Lundgren, Steve Austin, Terry Crews, Randy Couture, Eric Roberts, David Zayas, Giselle Itié, Brittany Murphy and Charisma Carpenter. The synopsis you ask, very simple; A team of mercenaries head to South America on a mission to overthrow a dictator. 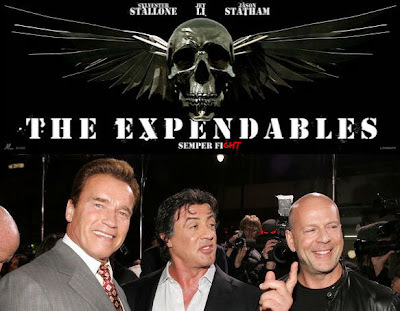 "The Expendables" is set for a April 23, 2010 release.